If you remember the squirrel and the rat that I wrote about last year, you will recognise the style of these paintings by the Belgian street artist Roa that I came across last weekend. With the building of the East London Line, Pedley St has become a forgotten cul-de-sac and I realised it was months since I had climbed over the iron footbridge from Cheshire St, walked under the smelly railway arch to turn left and make my way along the fragmented cobbled street – where on Sunday I was surprised by these enormous birds, startling in their scale and vitality. If you know where to look, you can even see them from Buxton St, a quarter of a mile away across the railway line on the other side of Allen Gardens. At first, I thought they might be emus but, on closer examination, the body shape is like a goose or a diving bird. My opinion, bearing in mind their scrawny necks and febrile scavenging nature, is that that they are cormorants. Whatever birds Roa thinks they are, they seem particularly at home in this neglected area of Spitalfields, where nature has taken over and where the neighbourhood foxes have their lair. So I recommend you take a stroll along there yourself, because this is a work that deserves to be visited in its chosen location and seen with your own eyes. In my enthusiastic haste to write to you about the squirrel and the rat last year, I quickly realised that I had neglected to notice several other paintings that Roa did at the same time. I am making up for it now by showing you this fierce bird in Spital St at the back of the Truman Brewery, this miserable lazy pig dozing on the pavement outside a tattoo parlour quietly ignored by a preoccupied smoker in Bacon St, this fine crow on a pair of doors also in Bacon St and this other little crow, round the corner on the shutter of the Brick Lane Boutique. Roa is unique among street artists for his unsentimental images of animals that, in spite of their exaggerated features, reveal an understanding of the anatomy, movement and personality of the species in question. He has a real feeling for the living world, his creatures are always quick with life and I consider him to be an unlikely wildlife artist. 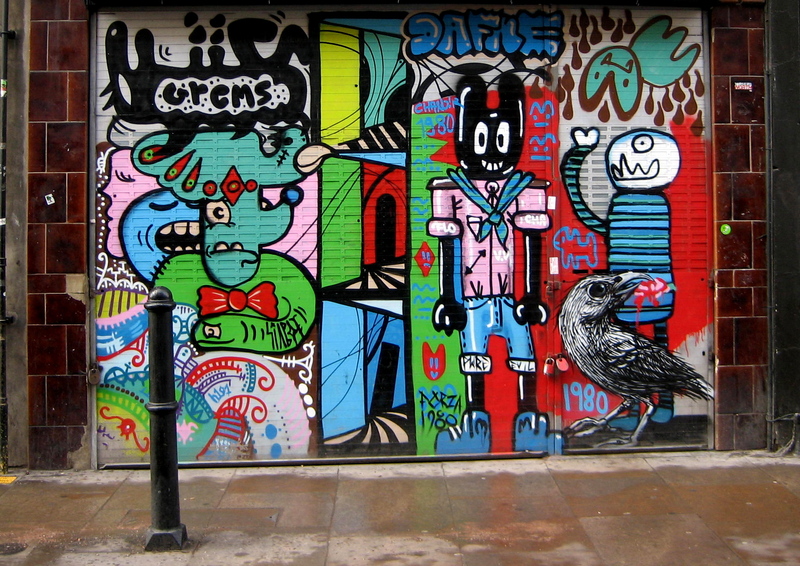 In each example, the presence of Roa’s charismatic vermin in this extreme urban environment raises a question about our relationship with nature, that can tenaciously adapt, survive and thrive – supporting a variety of animal life here even in such apparently unsympathetic circumstances. There is an unease about their presence, a tension that provokes us to see the reality of the cityscape we have created. His creatures may be at odds with the city but they are not defeated by it, they are clinging onto life, tooth and claw. They demand our respect. 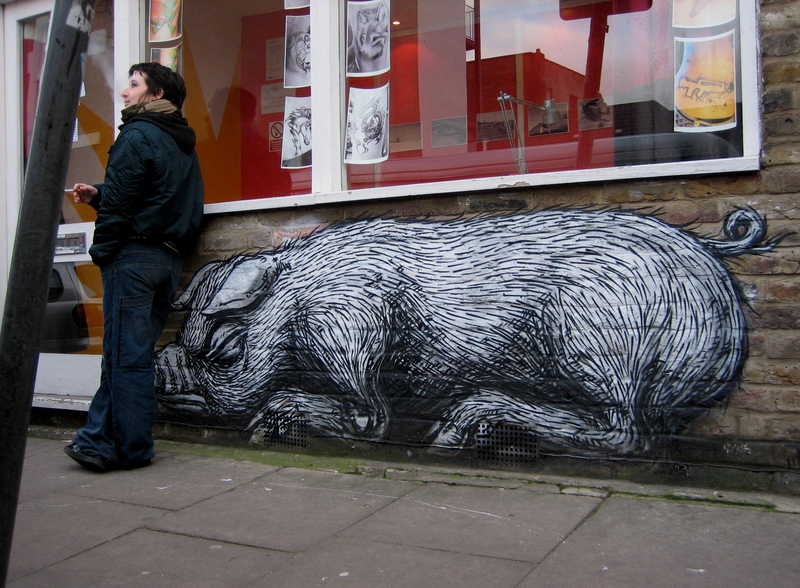 You can watch a timelapse film of Roa at work by night in Chance St on a painting of two pigs sleeping here. 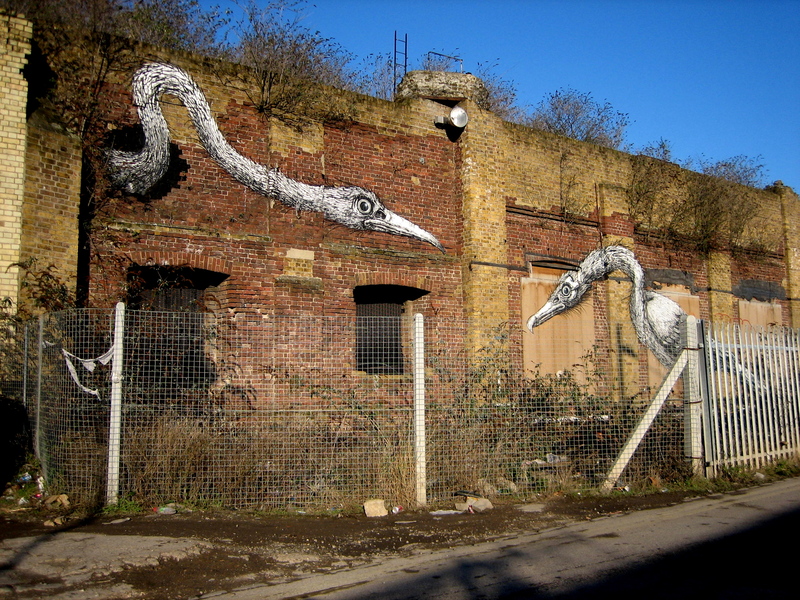 The short film successfully captures Roa’s natural draftsmanship in action and the immediacy of his spontaneous way of working through building up the image with feathery strokes, resulting in such lively paintings placed strategically in unloved corners of our neighbourhood. For those completists among you, there is a Flickr site here with all of Roa’s works, including a rabbit in Curtain Rd that I missed. These are the vermin I like. Wonderful post, so beautifully written. 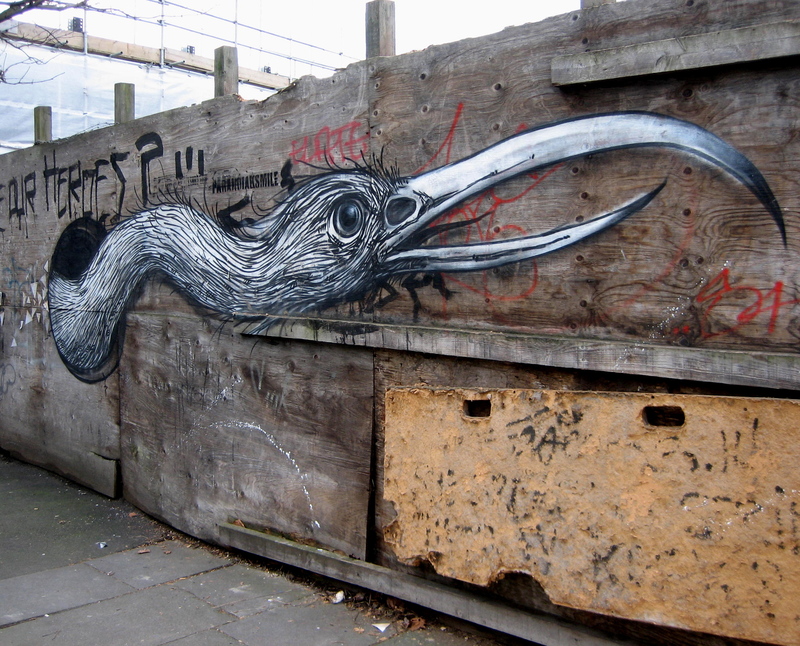 I think Roa’s work integrates perfectly into the urban environment. The birds fit the return to wildness in that pocket neighborhood. Wonder when gentrification will hit because that has to be too prime a spot to remain given over to the foxes for long, no matter how nice it is to have a place for foxes in the city. 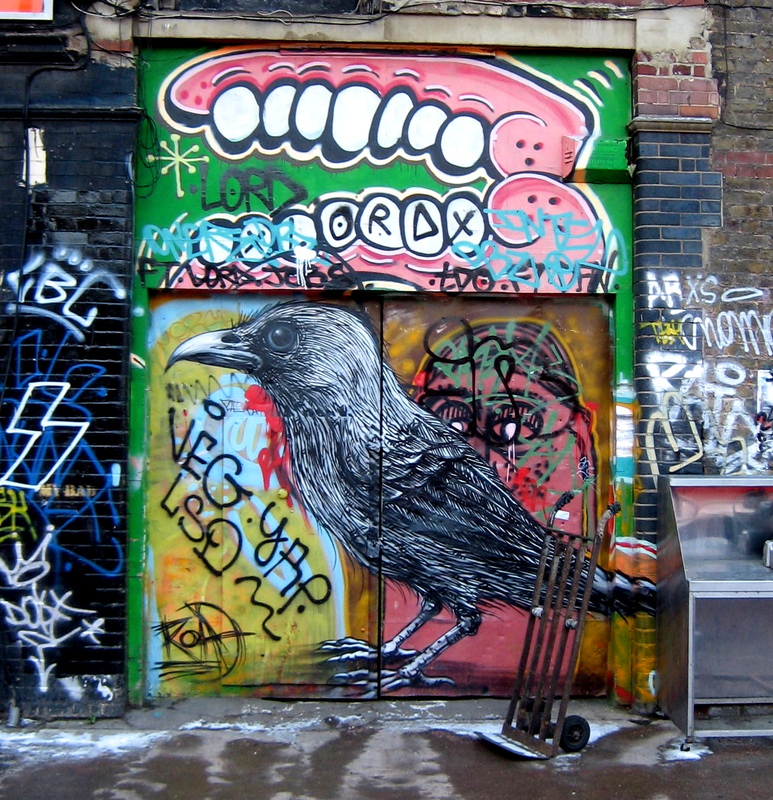 Hi, here is a film of Roa painting the big bird in Hanbury Street.